The famous adage that “breakfast is the most important meal of the day” isn’t going anywhere. There are varying schools of thought on this. Some nutritionists and health experts correlate skipping breakfast with things like a higher risk of coronary heart disease or obesity, while others believe these studies are designed to promote cereals and other breakfast food products. Wherever you fall on the spectrum, loading up on greasy bacon, egg and cheese sandwiches or whipped cream-topped waffles is never the way to go, as it can lead to sluggishness, leave you dehydrated for the rest of the day, and actually trigger you to eat more. The human body is already naturally pre-disposed to fat and carbs, so consuming foods that are high in both will make you crave even more of it. Think about that old Lay’s slogan about how “you can’t eat just one.” There’s actual science behind it. Fat and carbs are the culprit. They send pleasure messages to your brain that cause you to keep eating until you’ve devoured the whole bag! We’ve all been there. But it is possible to rewire your brain to steer clear of these calorie-filled energy zappers, and fuel productivity and cognitive performance to kickstart your day. That doesn’t mean you can’t indulge in a strip of bacon or stack of pancakes once in a while. If you save sodium-packed snacks for cheat days, and stick to the foods below the rest of the week, you’ll be well satiated and mentally prepared to start your work day. There’s a ton of fruit bowls out there right now, and they all offer varying degrees of health benefits. But ones you really need to protect the brain against oxidative stress and improve memory consist of blueberries, antioxidant-rich superfruits. They’re listed in Steven Pratt, MD’s book entitled ‘Superfoods RX: Fourteen Foods Proven to Change Your Life.’ Pratt even refers to them as “brain berries,” due to their ability to improve motor skills and learning capacity, as well as potentially reduce the effects of Alzheimer’s and dementia. 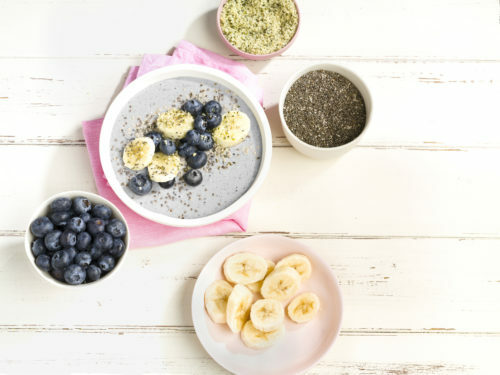 This Blueberry Protein Smoothie Bowl recipe is overflowing with nutritional benefits, combining five ounces of brain-enhancing blueberries with oats that have their own advantages for reducing low-density lipoprotein (LDL) in your body, commonly known as “bad” cholesterol. The soluble fiber in oatmeal reduces the absorption of cholesterol into your bloodstream, which improves blood flow to the heart and the brain. 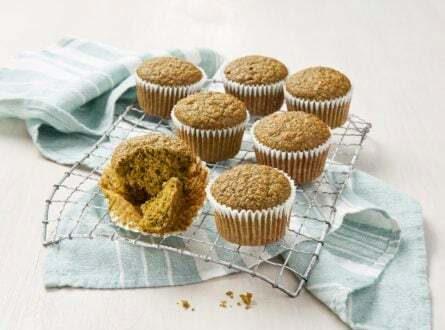 Adding honey to this tasty morning treat will help protect against allergies. Be sure to use a local honey because the more local honey you consume, the less affected you’ll be by the pollen in your area. Seriously. It’s the bee’s knees. Eggs become instantly healthier when you bake instead of fry them. Mixing in olive oil, a notable brain food, and garlic, which protects the brain from inflammation, allows for better absorption of nutrients, and has tested well in studies for protecting against brain loss in conditions like Alzheimer’s disease. Garlic also contains allicin, which helps decrease anxiety and depression. Who doesn’t need to free their mind from unnecessary stress? This recipe also incorporates spinach, a nutritional powerhouse and antioxidant, which aids in everything from lowering your cholesterol to boosting bone health to keeping your skin and hair glowing. When you look good, you feel good, and spinach packs in everything you need to thrive inside and out. It even has more potassium than a banana. So pop this protein-rich dish in the oven, and get ready to take on the world. You’ve got this! Store-bought cereals that are packed with processed sugars will give you a quick burst of energy, but that high won’t last very long. If you go that route, you may end up crashing, and feeling tired and listless for the rest of the day. Instead, opt for a cereal that contains natural sugars from fruit to give you a gradual release of energy that will extend beyond the morning. 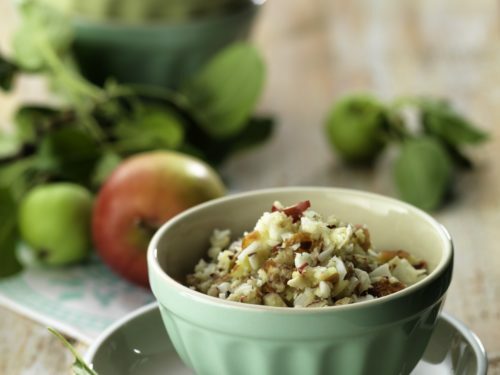 Try this Apple and Pear Hot Cereal. It’s a mind-sharpening meal that blends the brain-boosting benefits of farro and flaxseed with apples, rich in quercetin, an antioxidant plant chemical that protects the brain by shielding it from free radicals to prevent memory loss, sustain energy, and improve mental performance. This hearty dish will also help curb mid-morning cravings so you can stay sharp and satisfied, at least until your lunch break! For those on the go, you can’t go wrong with good ‘ol granola. It’s portability and unparalleled appetite-suppressing ability will keep you going strong. Want more benefits? Load the granola with nuts to get an array of advantages, such as Omega-3 rich fatty acids that help prevent heart attacks, as well as high levels of Vitamin E to offset cognitive decline, increase alertness, and preserve memory longer. This Two Second Breakfast recipe does the trick and yes, it’s the quickest and easiest way to upgrade your brain in hurry. 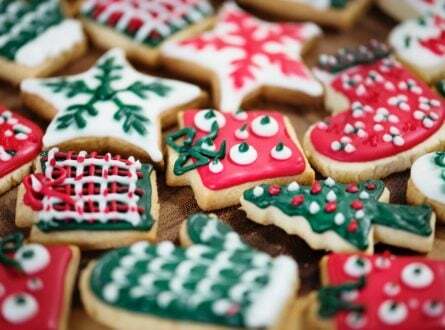 To see more healthy breakfast recipes, activate your free 30-day Cookidoo® trial today!